It's Day 4 of Whimsy Stamps May Rubber Stamp and Die release! 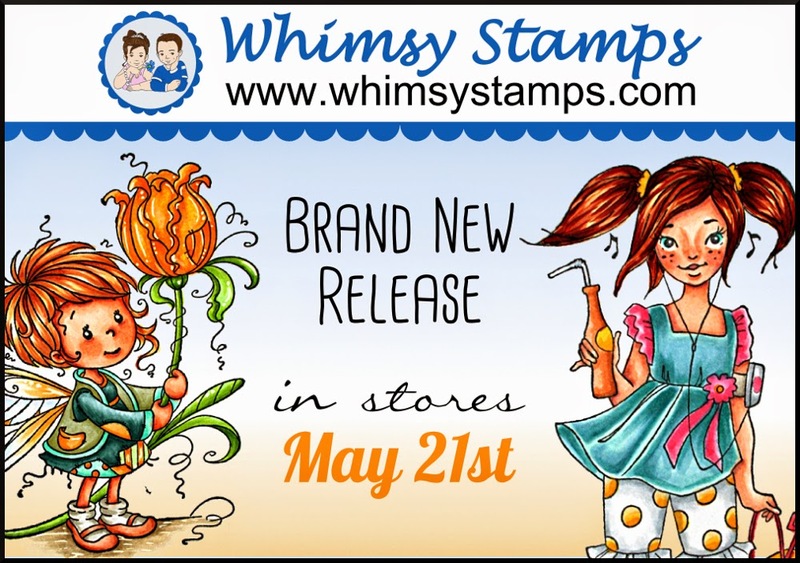 The entire release is available to buy from the Whimsy Stamps store and from all good Whimsy Stamps retailers from Wednesday (21st May). Today the DT are showcasing images from Artists Crissy Armstrong and Ciara's Friends by Sandy Allnock . I have been chosen to feature this sweet image perfect for summer time, Ciara and Penny by Sandy Allnock. Wow Danielle - I love... wait... LOVE the way you colored the puppy in this one! He looks soft and fuzzy and perfect. Very well done! Gorgeous card, Danielle! Fantastic coloring of the sweet image! LOVE your Adorable card!!! Your coloring is FABULOUS!!! Cute image. Love the papers. Aw, that's so cute! Your colouring is beautiful! Gorgeous papers too and I love the little sentiment tag! A gorgeous cheerful card. Your colouring is beautifully done and I love the idea of the acrylic drops for the water droplets. I love cards with doggies in them! Wow this is coloured so well love how you did the dog, this image is lovely and the design of your card is beautiful. Fabulous card. Beautiful coloring. The inner tube looks really wet. Wonderful card. I love the fun image. Oh, my goodness!! Love the coloring and card! this card looks so cheery and bright! What an awesome happy image!! Love the colors of paper coordinated with your coloring! Wonderful sweet and fun card!! It's a sweet summery card Danielle! Love your colour choices. What a stunning card Danielle. Your colouring is amazing. The fantastic shine on the inflatable ring and you can almost feel the wet nose and big sloppy tongue on Ciara. I love this cute image. Your paper selection add so much fun too. What a sweet image and perfect summer card. Great colouring, and I love your papers! Such a bright and fun card!